In the city that's become a symbol for the death of the American dream, a nightmare killer is unravelling reality. 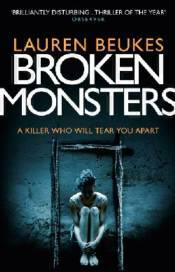 A terrifying new thriller from Lauren Beukes, award-winning author of The Shining Girls. Detective Gabi Versado has hunted down many monsters during her eight years in Homicide. She's seen stupidity, corruption and just plain badness. But she's never anything like this. Clayton Broom is a failed artist, and a broken man. Life destroyed his plans, so he's found new dreams - of flesh and bone made disturbingly, beautifully real. Detroit is the decaying corpse of the American Dream. Motor-city. Murder-city. And home to a killer opening doors into the dark heart of humanity. Edgedancer EDISON'S FRANKENSTEIN BY FREDERICK C. WIEBEL, JR.
NON-STOP NOPE, NOTHING WRONG HERE: THE MAKING OF "CUJO"